We made a wedding cake! I feel like you need a moment (or two or three), for this to sink in. (I still can’t really believe it.) 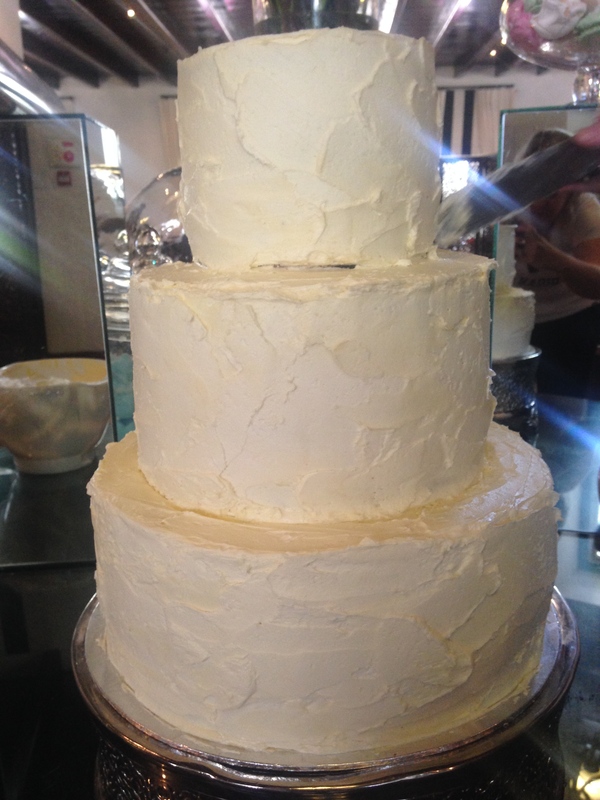 We actually made a three-tiered, rather lovely (if I do say so myself) full-on wedding cake. That the bride loved. And people ate. Win! 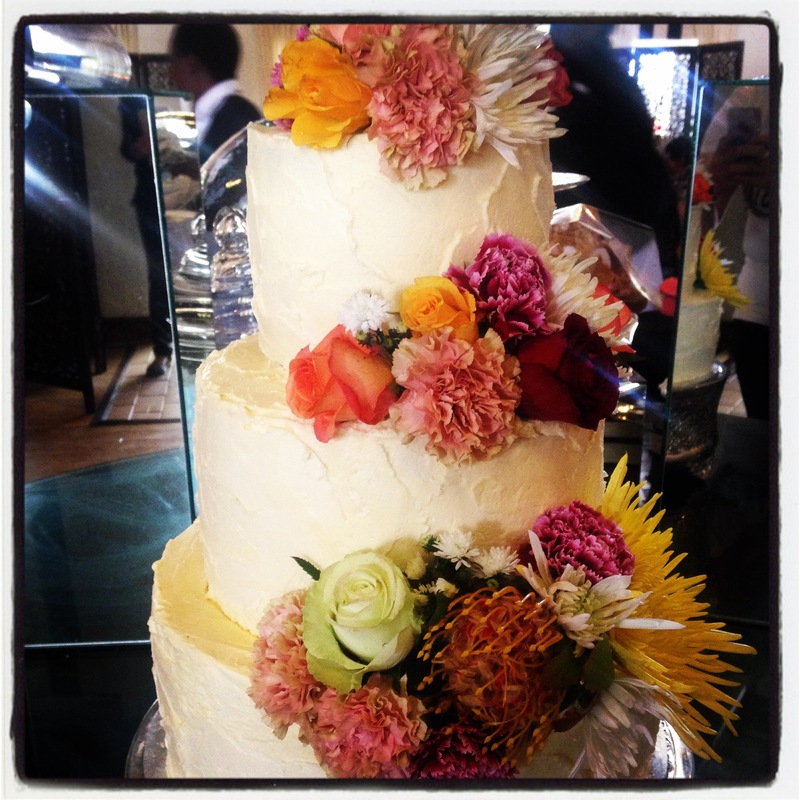 In my head I had several rather fantastic posts planned about the process of making a wedding cake. You know, all about baking the cakes, using a foreign kitchen, icing and then setting it up. Etcetera etcetera etcetera. But it turns out that actually making a wedding cake and then photographing the process are not really things that can honestly be done in tandem. Particularly when you’re working after-hours in a tiny kitchen with no windows. And drinking wine. There is no way you can legitimately blog about that process as it happens. Perhaps if you are organised and make the cakes in advance you could, but we made the cakes on Thursday night and Friday afternoon, filled and crumb-coat iced them on Friday night and then final iced and assembled on Saturday morning… There was little time to mess about with cameras and styling. We shot all the evidence with our phones. Here is the story of the cake. 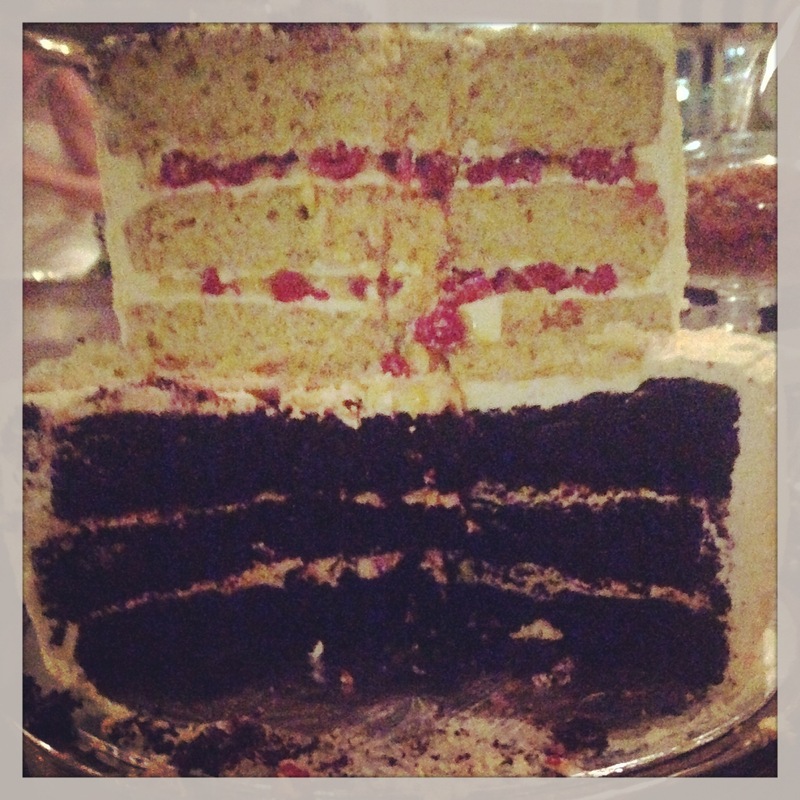 This cake was a collaborative effort. Raphaella, who went to the same chef school as me and works as a food journalist, and myself tag-teamed the making of this cake. (The bride went to school with us, in case you were wondering how this collaboration came to pass.) Most of the consultation process took place via email with the bride – neither of us live in Johannesburg, where the bride lives and the wedding occurred. Raph suggested various flavour combinations and eventually we settled on chocolate for the bottom tier and lemon for the next two tiers. Obviously this did not mean just chocolate and lemon. The chocolate tier was chocolate sponge, coffee buttercream and walnut praline whilst the lemon layers were lemon and white chocolate sponge, lemon curd and raspberries. 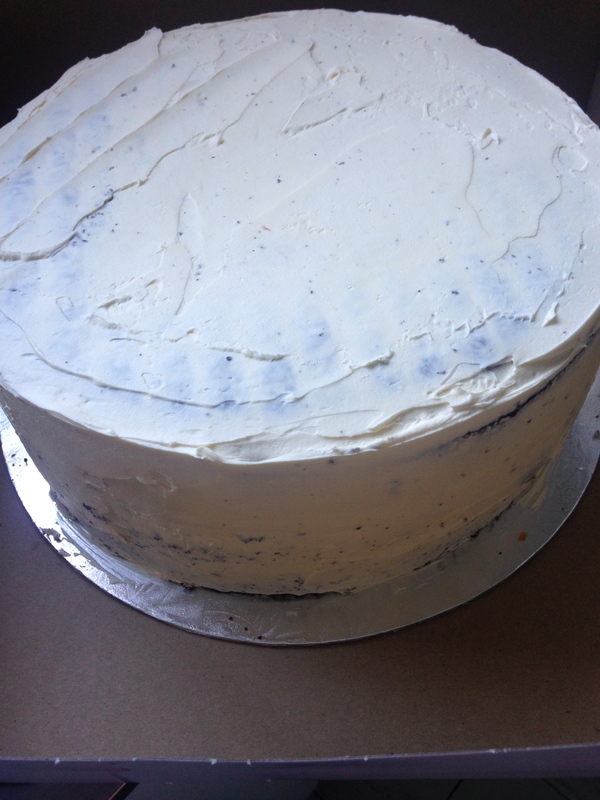 The whole cake was covered in a silky smooth vanilla buttercream. 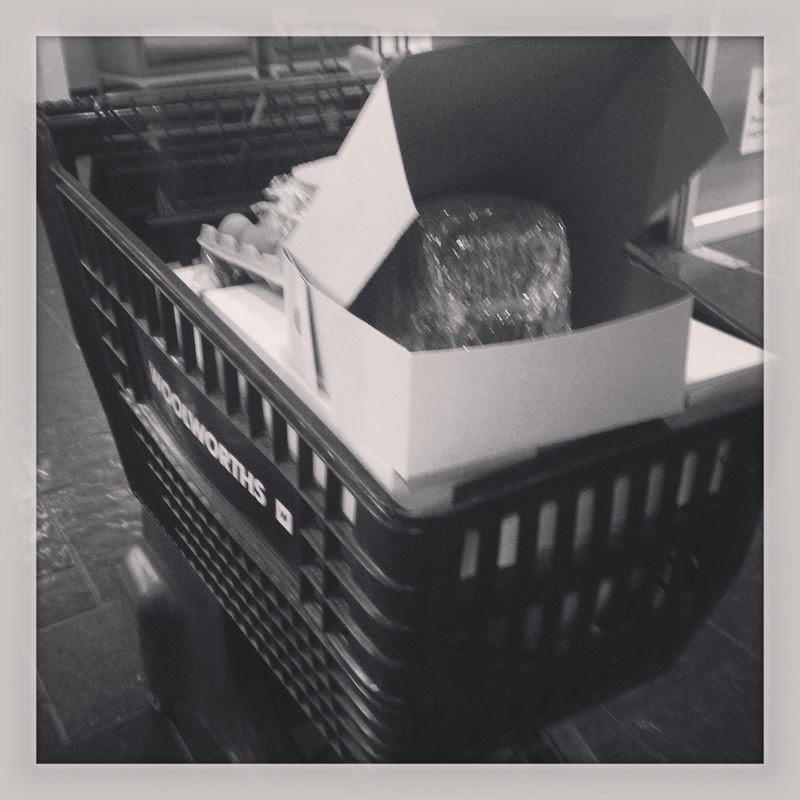 We loaded the cakes into their boxes and then put them, all the ingredients (and part of our sanity) into a shopping trolley to take downstairs. The security guards thought we were hilarious. 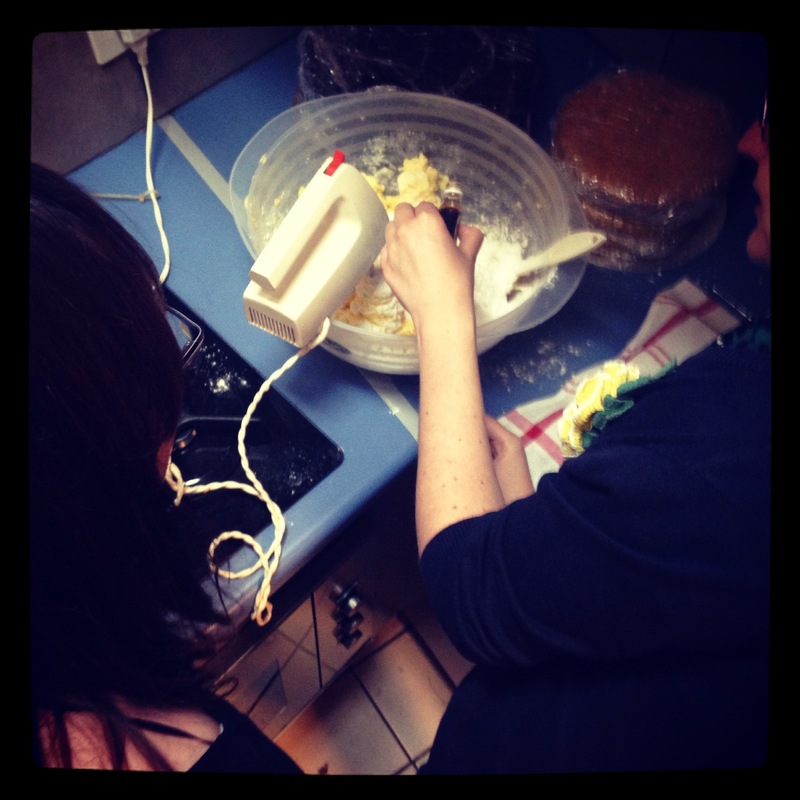 Once we’d made it into the new kitchen, we celebrated at the presence of a standing mixer, and got down to the business of buttercream. 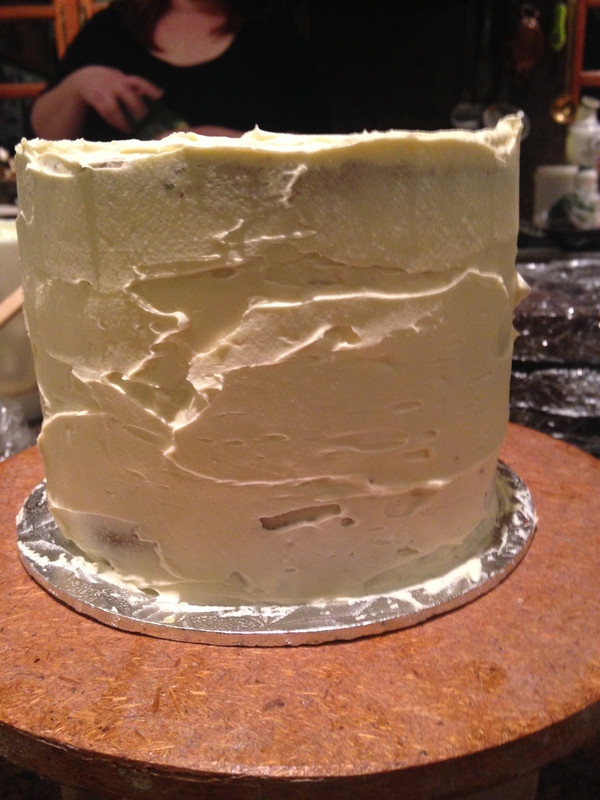 Raph had already made the walnut praline and lemon curd and so, with the buttercream all soft and silky, the incredibly scary process of layering could commence. 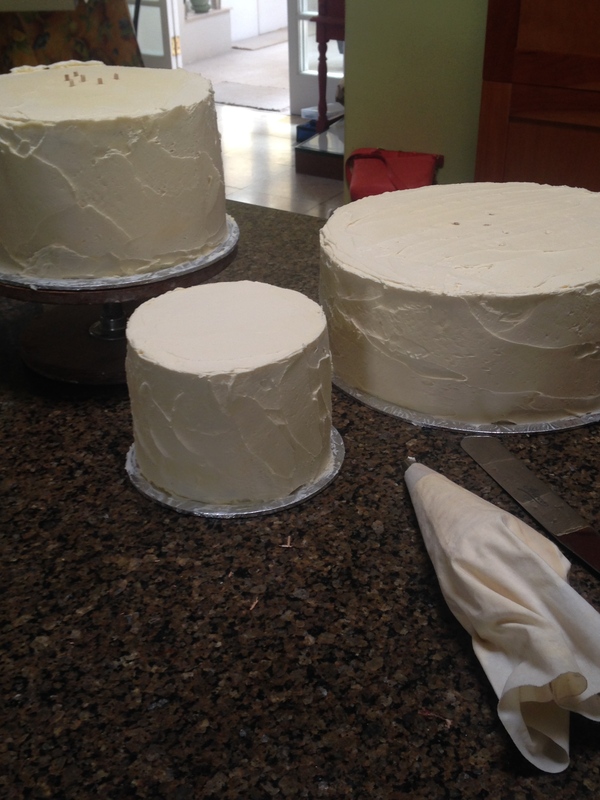 There is a reason, of course, why people freeze large layers of wedding cake – it makes it significantly easier to assemble. Whilst the 16cm and 23cm layers were reasonably easy to put together, the 30cm ones stretched our stress levels to snapping point. The middle layer of the 30cm tier was the worst, collapsing slightly as we put it a-top the first layer. After much cursing we finally got it neatly positioned. We then re-thought the entire assembly process for the final layer. Everything was crumb-coated and refrigerated overnight. Large whisky cocktails were consumed. The next morning we were up and at it again, making another batch of buttercream and giving the layers their final coat of icing. Then came possibly the most stressful part of the whole debacle: transportation. 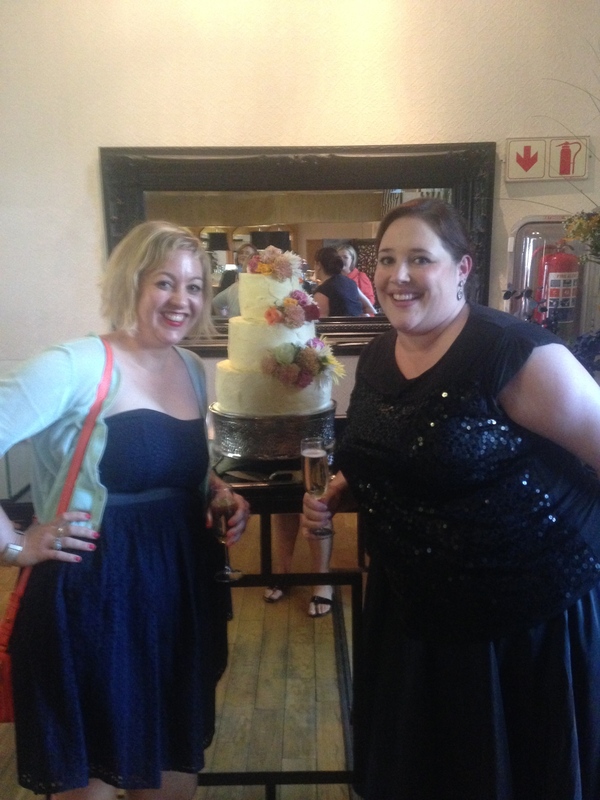 The reception was at Wits Club, on the Wits University campus – a mere 10 minute drive away. But the cakes had to be boxed and placed carefully in the car (and held by Raphaella and Ernst, her husband and corrupted helper) whilst I drove. I have never realised how uneven Joburg roads are but that day I think I hit every bump, surface change, and pothole available. It was ridiculous. And then there were the impressive speed humps just before the venue. There were a lot of deep breaths and curses on that short drive. But we made it to the venue! When we arrived we realised that the venue is, in fact, a working restaurant and unlike the quiet, calm atmosphere we had both envisioned would be available to us whilst setting up the cake, the restaurant was busy, loud and full of customers having breakfast. We would have to assemble the layers with an audience! Shaking like leaves in a very violent winter storm, we slowly put one layer on top of the next. We patched any smudges and fixed any imperfections. Various people came up to talk to us whilst we were doing this (including one woman who wanted to know how much we would charge) and we tried to be as pleasant as possible, all the while silently cursing their questions. But slowly, slowly, we got it done. Flowers were artfully arranged – for which Raphaella must have full credit. I ran around looting flowers from additional arrangements that were going spare. And then we took a million photographs – you know, just in case something awful happened between our leaving the cake alone and the bride arriving to see it… Which it didn’t. When we arrived back in the evening, we snapped more photographs (and, as you can see above, had a celebratory photograph with our cake) and drank a lot of champagne. And later still, the cake actually got eaten! So that is the story of the wedding cake. Yes, I would do it again. But only if I could bake and ice from my own kitchen. 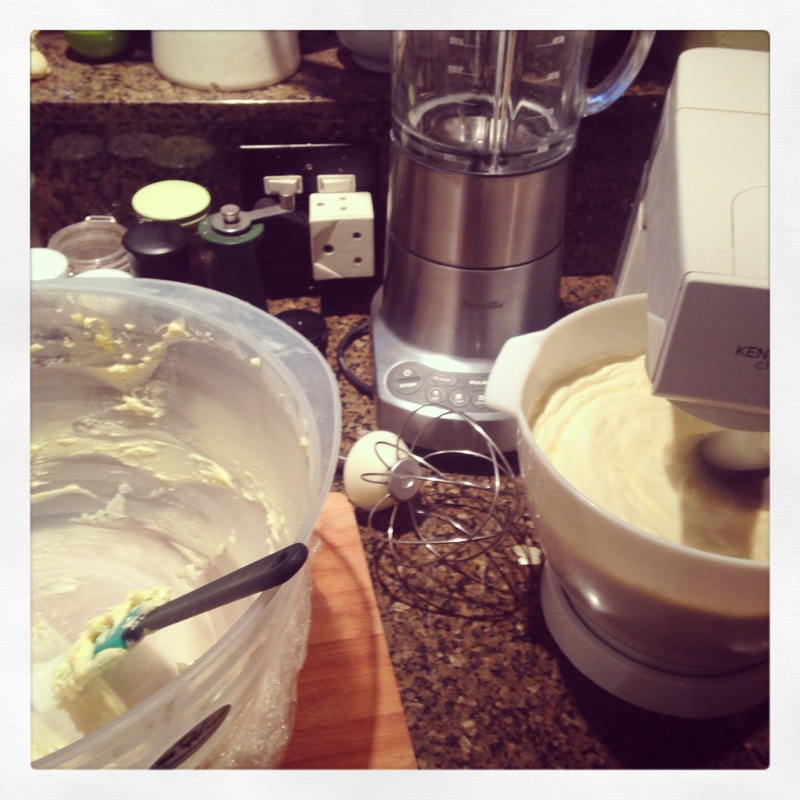 With a standing mixer. You mixed cakes by hand????????????????? ?